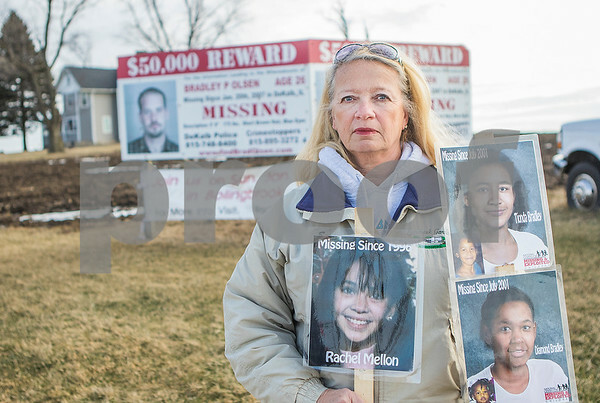 Standing in front of the sign in Maple Park sharing information about her missing son Bradley Olsen, Sue Olsen, holds photos of other missing people on Friday, Jan. 29, 2016. On Sunday, Olsen will join the families of missing people across Illinois as they mourn the 20th anniversary of Rachel Marie Mellon Skemp's disappearance. The gathering will take place at BJ Ward Elementary School, 200 Recreation Drive, Bolingbrook, and will include a balloon release and a reading of the names of 200 missing people, including Bradley Olsen.